So this salad is one of the easiest things I have shown you guys in a while. I actually feel a little guilty for posting such a simple recipe. I feel like I should be able to show you guys something a little more exciting than a summer chopped salad, but the bottom line is this is, this is a really awesome salad. Not to mention that I have hit the summer creativity road block. Essentially, this means I really only want to eat caprese melts, big salads, grilled bread, cherries galore and basically anything grilled. And even though I am loving these foods, I hate it when I can’t actually think of something new to do with them. Sure I have ideas, but in my head none of them actually seem good enough to show you guys. Recipes have to be great to make it up here or I just will not be happy with myself. See, I was going strong with almost too many new ideas (yeah, your right, not possible to have too may ideas). Things were moving along at a nice steady pace. Obviously, I should have known that a road block was bound to be up ahead. That’s just the way things go. As my mom always tries to tell me, not everyday can be an awesome one. Of course, I certainly wish they could all be awesome. Awesome, beautiful and delicious, because the not-so-great days just irritate me. Anyway, this is one of my favorite salads to make during the summer. A lot of times I will bulk it up with some quinoa and hard-boiled or fried eggs, but today I wanted to show you the simplest version. 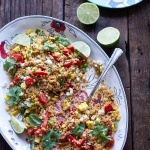 It’s perfect for any potluck, summer cookout or just as a light, easy meal. I also love stuffing the salad into hard tacos shells. It makes for a pretty awesome veggie taco. And let’s be honest, everything is better in taco form. Right? 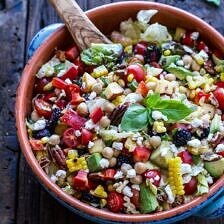 You can make this salad to go with almost anything, Adjust the flavors and veggies/fruits to your liking. It literally comes together in 10 minutes!!! YES! I like to grill my corn, but if you don’t feel like making the extra effort it’s not a huge deal. You can just use fresh raw corn. Other than that there is absolutely no cooking involved. Just some chopping and tossing. I actually love this salad once it’s gotten a chance to sit in the fridge for a while so that the dressing can really sink into everything. The lettuce doesn’t stay crisp, but I don’t know, it’s still so good. Sometimes I will toss everything together minus the lettuce, place the salad in the fridge with some of the dressing on and then stir the lettuce in just before eating. Now that I’ve thought about it, that’s definitely the best option! Last thing, don’t skimp on the goat cheese. It adds so much flavor, it’s just too good to skimp on! 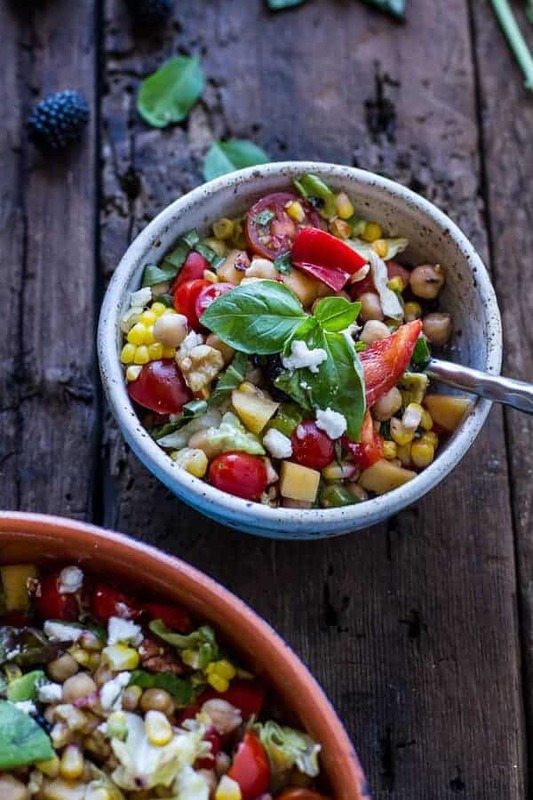 This tasty salad is perfect for any potluck, summer cookout or just as a light, easy meal. 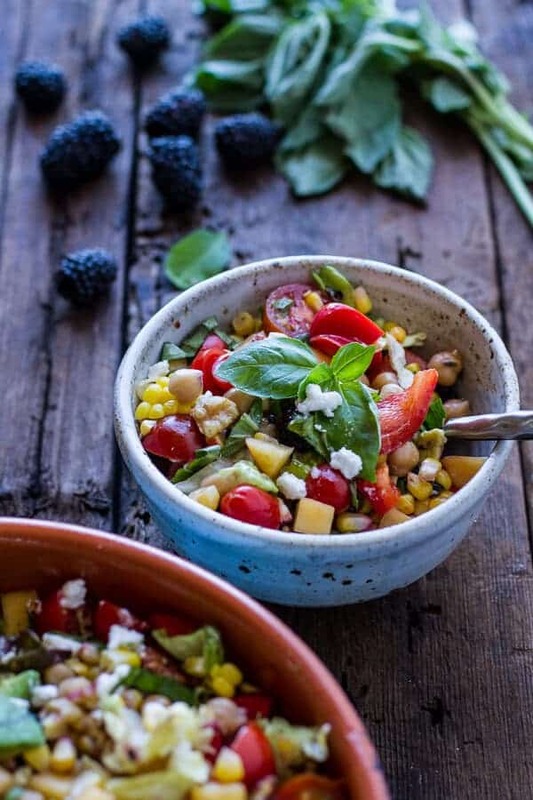 In a large bowl combine the butter lettuce, basil, parsley, thyme, grilled corn, tom-tom tomates, red pepper, blackberries or blueberries, peach, jalapeño and chickpeas. 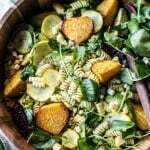 In another small bowl or glass jar combine the olive oil, apple cider vinegar, honey, chipotle chili powder, garlic, lemon juice, salt and pepper. Whisk until combined. Once ready to serve, pour the dressing over the salad and toss well. Add the avocado and goat cheese and gently toss once more. Serve. Sometimes it’s nice to post a simple recipe! I always worry if a recipe is so simple, but sometimes it’s just so good it must be shared. And there will be no skimping of goat cheese here…I breathe the stuff! Pinned! I totally understand. Sometimes I feel like if a recipe or idea is not over-the-top special or creative, it’s not worth posting, but simple and easy to throw together is much needed in most people’s lives. Also, it isn’t simple in taste! This thing must burst with amazing flavors. I heart goat cheese so much too. Delish. Easy is totally what I need these days! This salad looks absolutely fantastic. I feel like I would probably eat it for days. And I understand the summer road-block! 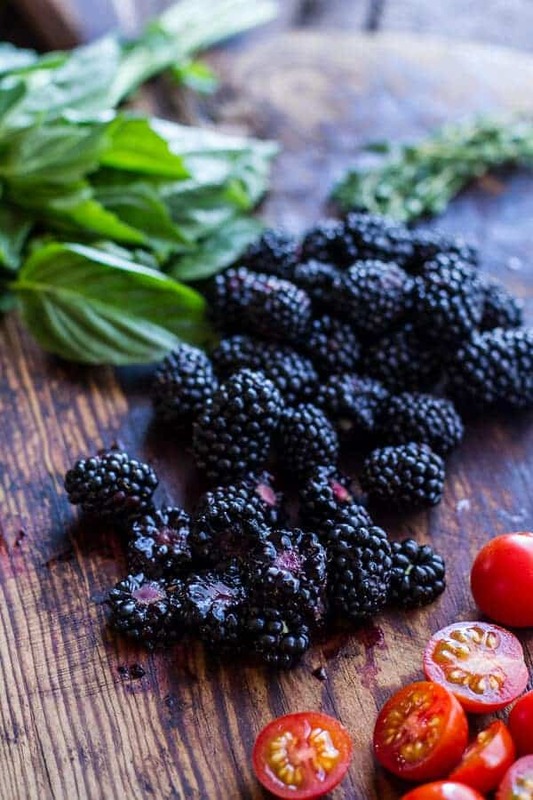 I feel like you can only come up with so many summer recipes before you’re tapped out. Hopefully my readers have no problems with all frozen treats next week because that’s the only thing going through my brain these hot days of summer. This salad looks like it will be one of my favorite things because it has all of my favorite things! And, sometimes I like posting a simple recipe because sometimes the combination is new for others, ya know? Have a good 4th! 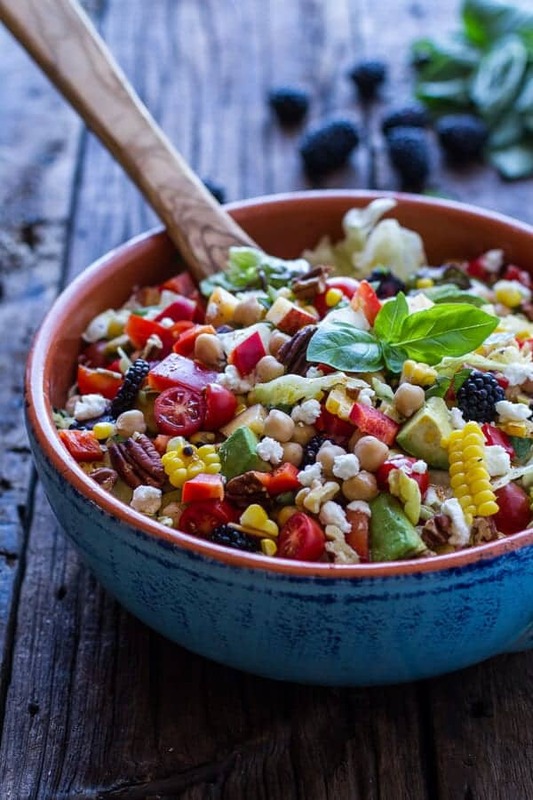 I love a chopped salad…everything seems to taste better and blends together better when it’s chopped small. Every bite is a good bite. 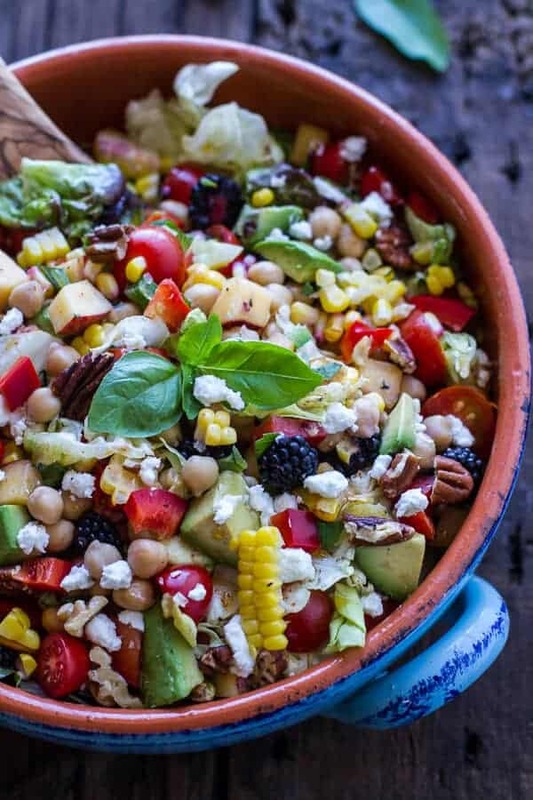 I love adding fruit to veggies salads..this is a winner. I have been in a 6 month roadblock! 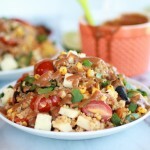 Totally jnow the feeling, but love this recipe! I totally know what you mean in terms of recipe block–but really, some of the simplest ones are the best! 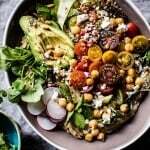 This salad is beautiful Tieghan, love the photos! Thanks Laura! Happy 4th! Hope you have a great weekend! I personally love simple recipes and would be more inclined to make something like this. It looks delicious! This sounds amaaaazing! I am loving all of the fresh fruits and veggies in this! Thanks so much!! Have a great weekend and happy 4th! Yay for simple!! 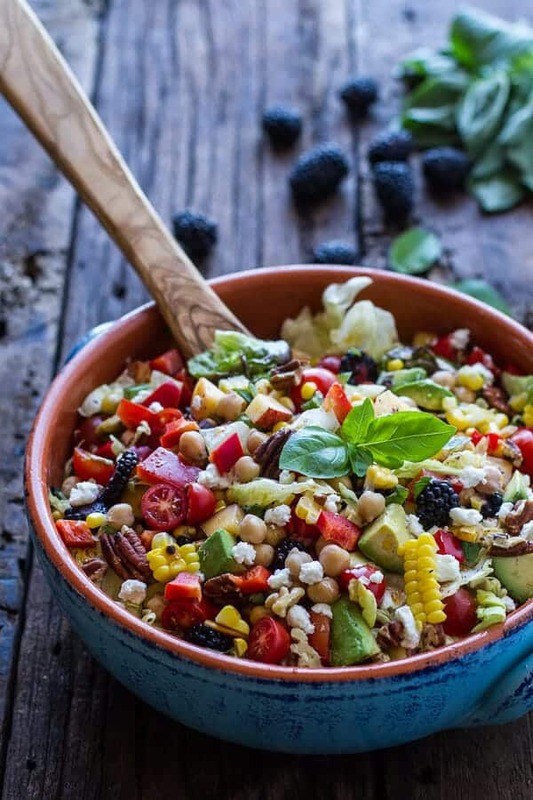 Perfect for an amateur cook like me 🙂 There is so much yumminess in this salad – every bite would be special. Thanks Todd!! Hope you are having a fun 4th of july!! 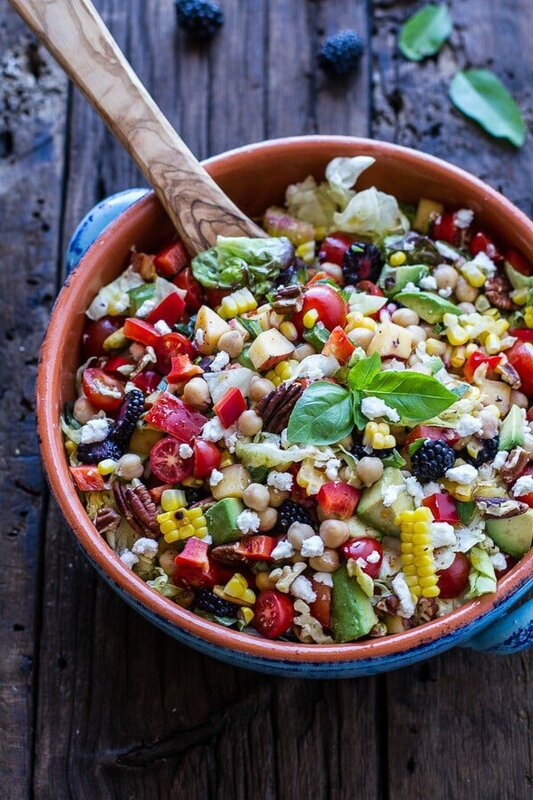 I’m obsessed with chopped salads and this salad looks so beautiful and delicious! So gorgeous, it reminds me of summer in a bowl! This salad is fantastic, it’s such a good balance of fruit, veggie, protein, and cheese. Plus it looks beautiful! Mmm yeah so this salad is happening every day for the rest of the summer. YUM. Thanks Stephanie! Hope you and guys are enjoying your 1st 4th of July as a new family!! Have a great weekend! 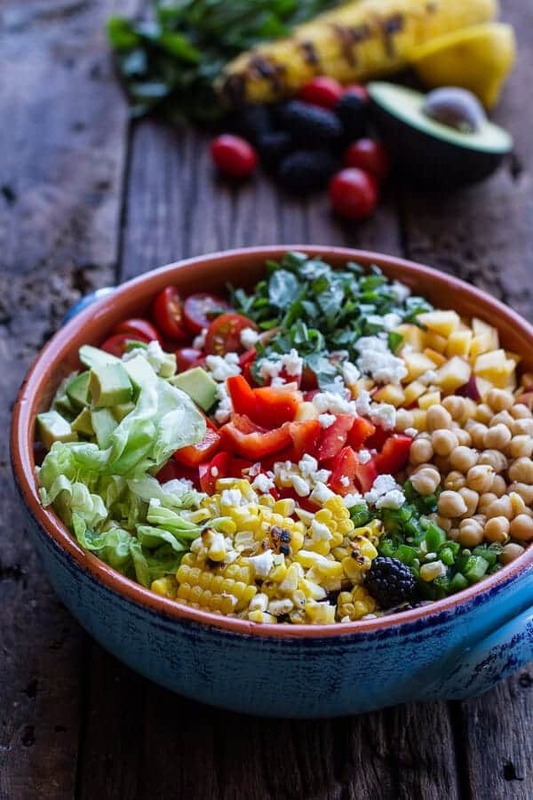 Love everything about this salad. I could eat this every day! Seriously, girl, this IS a creative salad! If this is what your creativity road block looks like, I’d say you’re sitting pretty. It looks gorgeous and simplicity rocks in my book! Thanks Julia! You are the best! Hope you are having a great 4th of July tonight! Sometimes simple is definitely the best. Looks like a delicious salad! Thank you so much! Hope you have a great weekend and happy 4th of July! Thank you so much! Means a lot! 🙂 Have a great weekend! I’m so excited about this! It’s going to be lunch and dinner tomorrow I’m pretty sure. Happy weekend, Tieghan! Yaaa!!! Thanks Katie! Hope you guys had a fun 4th!! Hi there! I was wondering if you had a tip for cutting the kernels off of the corn in larger kernel pieces as you have pictured- I’ve tried a few different methods and they continuously break apart into single kernels. thanks!! Hey Jamie! It honestly depends on the corn I think. Also, I try and cut as close to the cob as possible. That helps to keep them intact. I think the fresher the corn the better. Hope that helps! THANKS! Thanks for a delicious and healthy recipe! My husband just broke his collarbone and is worried about gaining back all the weight he had been losing up to this point, so I’m trying to make healthier, but filling dinners during his recovery. This was a huge hit last night! I subbed in blueberries and strawberries for the blackberries and peaches, and it was awesome! So happy you loved this!! I love you swaps. THANKS! This was amazing! I added baked tofu and a combination of barley and farro. And I used rice vinegar because I didn’t have apple cider vinegar. I didn’t have any goat cheese on hand either, but imagine it would be amazing. And I left out the jalepeno because I’m wimpy that way. It was delicious!! So happy you loved this and I your choice of grains! This was amazing! I can’t believe you even thought of not putting it on since it’s a “simple salad”! It has so much more complexity than that. And this was the first time I’d used chipotle chili powder. Thanks for introducing me! This looks great! But why is the 4th photo repeated 4 times? Is that an error? So happy you loved it! Thanks Peggy! This has been put into regular rotation for summer dinner. Delicious! YAY! So happy you love this! Bummer, your salad recipes won’t load. Don’t know why. Looks and reads delicious! How many does this serve?